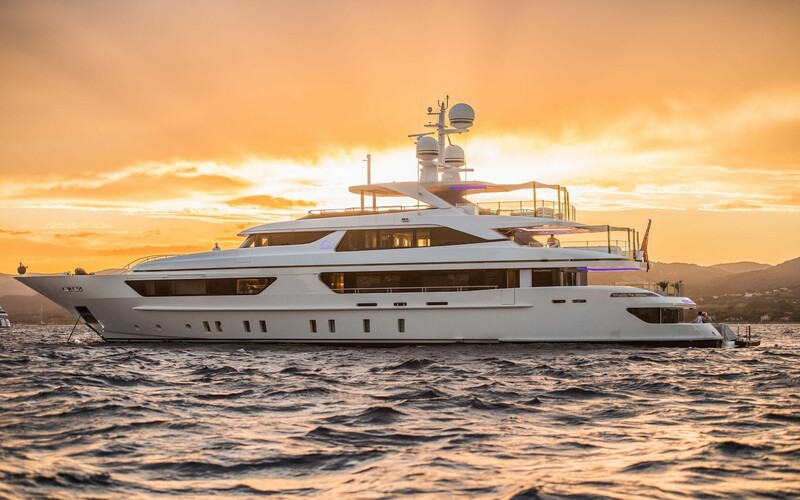 46m/151ft LUXURY SUPERYACHT from Sanlorenzo is an impressive 2015 46STEEL charter yacht constructed with a steel hull and aluminium superstructure. 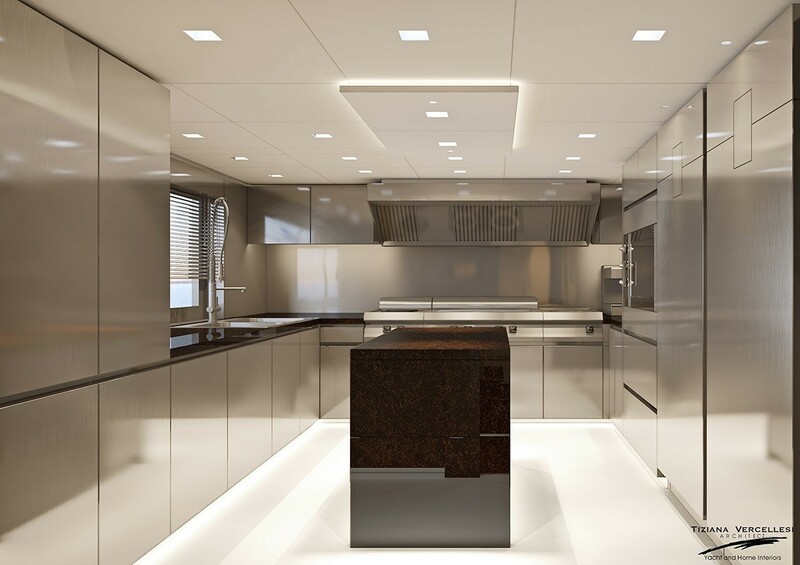 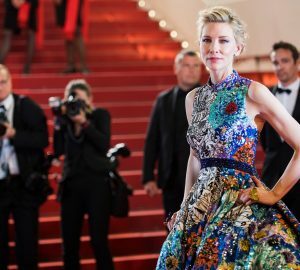 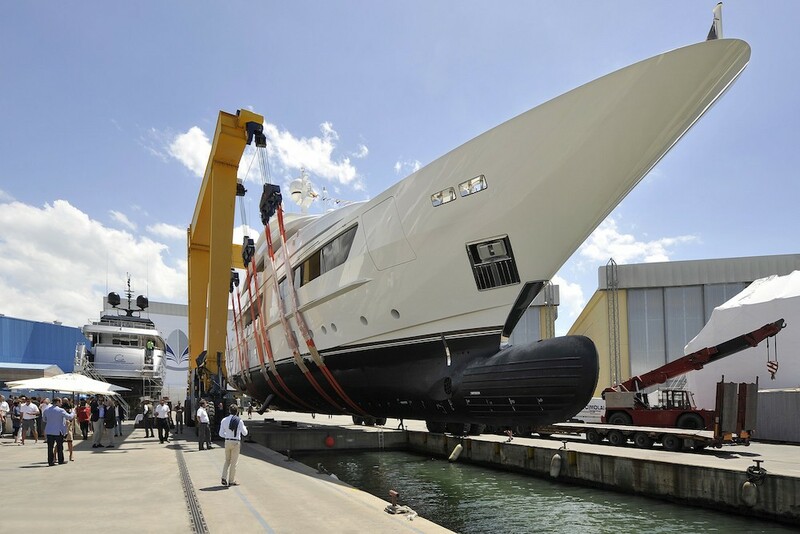 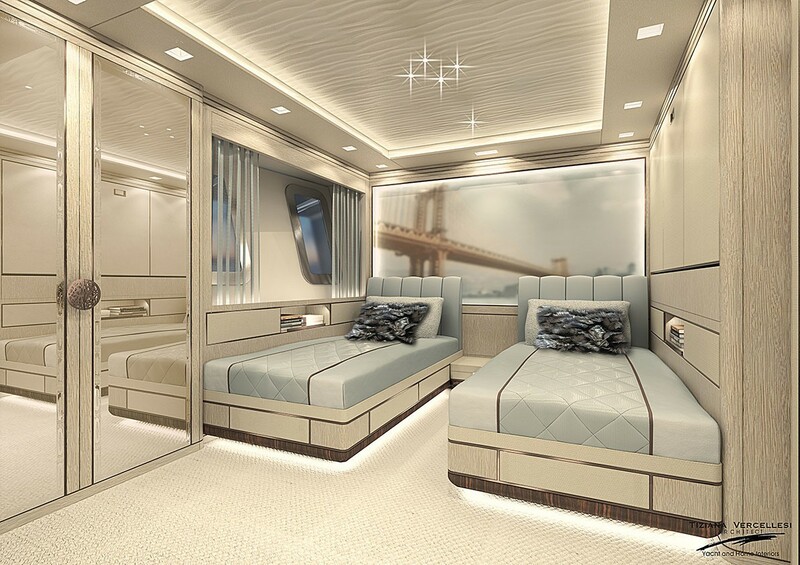 The shipyard also completed the naval architecture and exterior styling, while the interiors are the work of Tiziana Vercellesi to a design by the Owner with an Asian aesthetic. 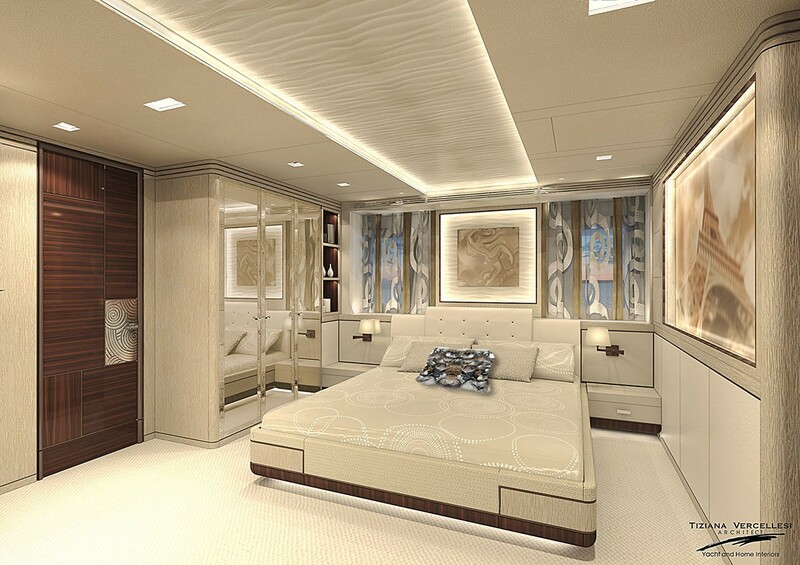 The accommodation provides for up to 12 guests across five bright and spacious cabins. 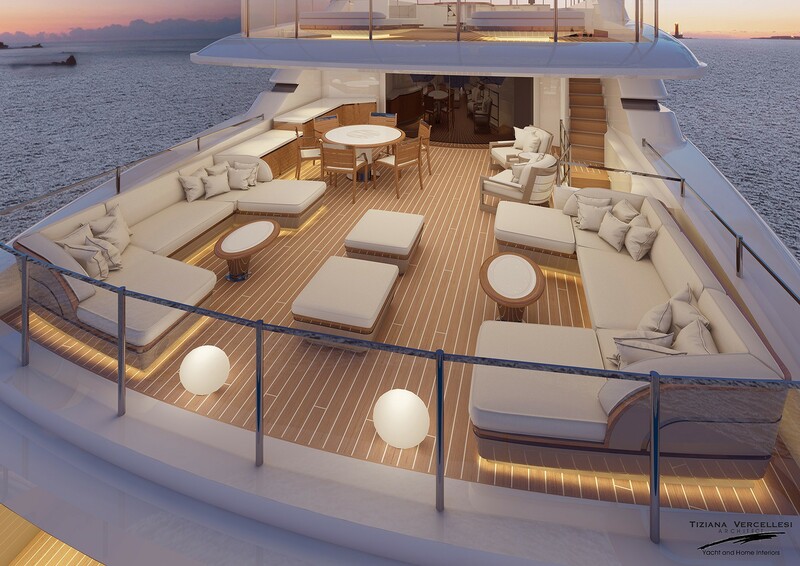 The main deck aft connects to the swim platform and provides guests with two L-shaped padded seats for drying off in outdoors after water sports and savouring a casual alfresco lunch. 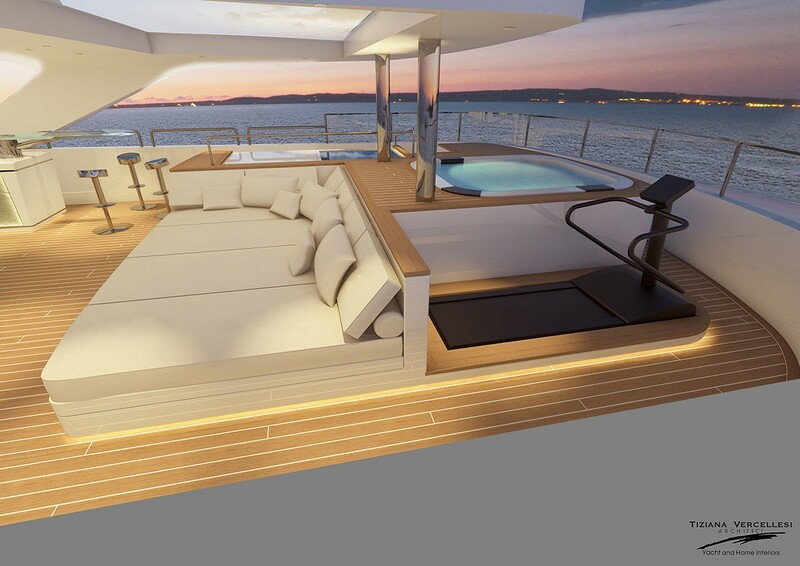 The upper deck aft has an abundance of seating, with two drinks tables placed under the sundeck overhang while integrated seating along the stern can be exposed to the sunshine or covered by a canvas. 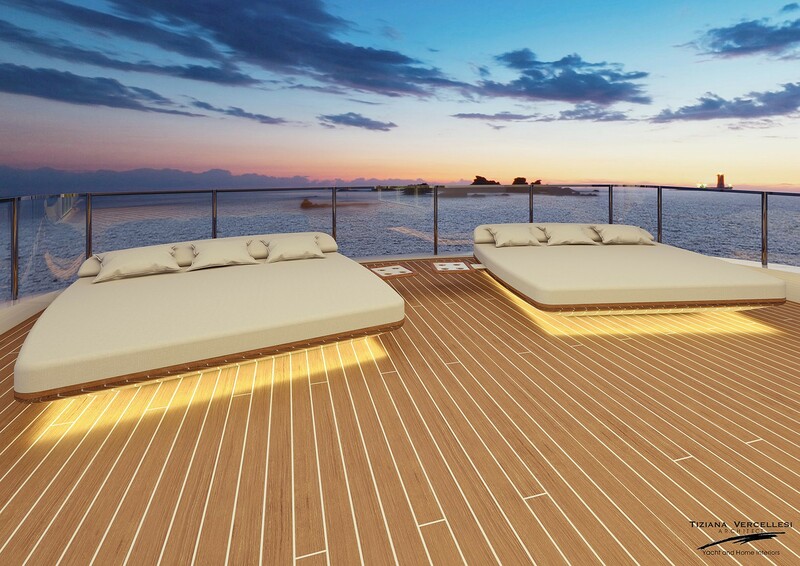 Forward, the Portuguese deck provides another space for guests to unwind in the sunshine. 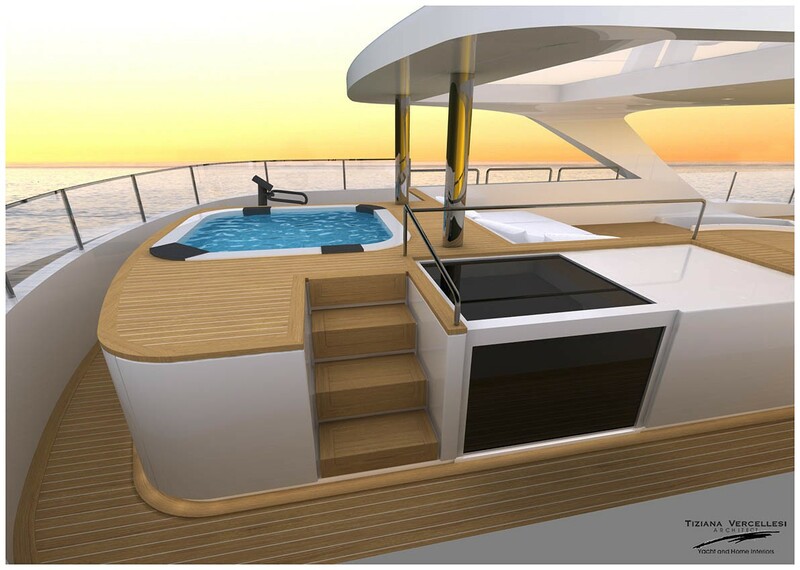 For the best views on board and all-day sunshine, the sundeck offers guests a choice of sun pads to the aft and forward, beneath the hardtop overhang. 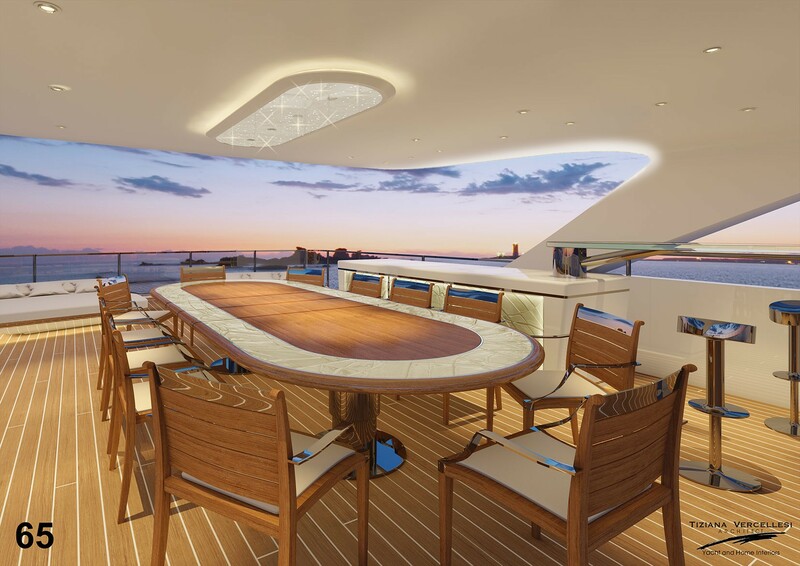 A massive Jacuzzi is placed on the sundeck forward for the best views day or night, while under the central section the wet bar has an impressive selection of refreshments for guests of all ages dining alfresco at the 12-person table. 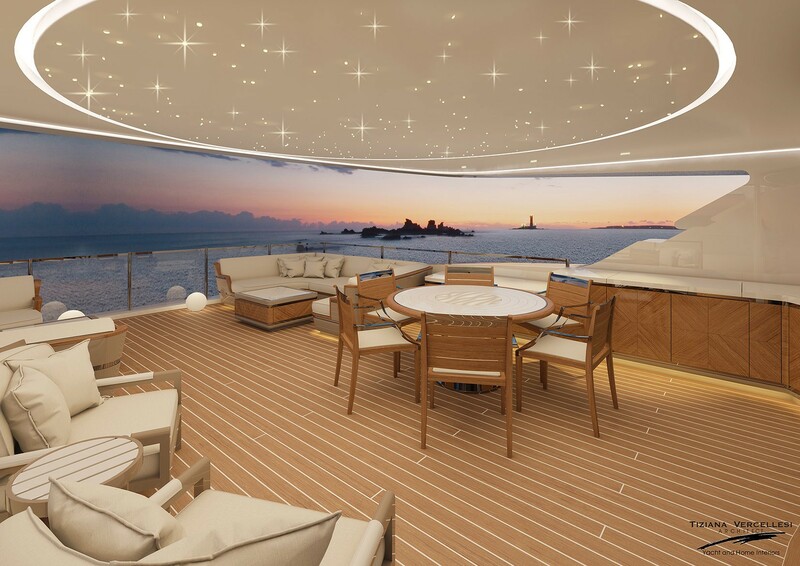 On the lower deck, there is space in the stern for a gym and a sauna, which opens up to the fresh air and ambient sounds close to the water. 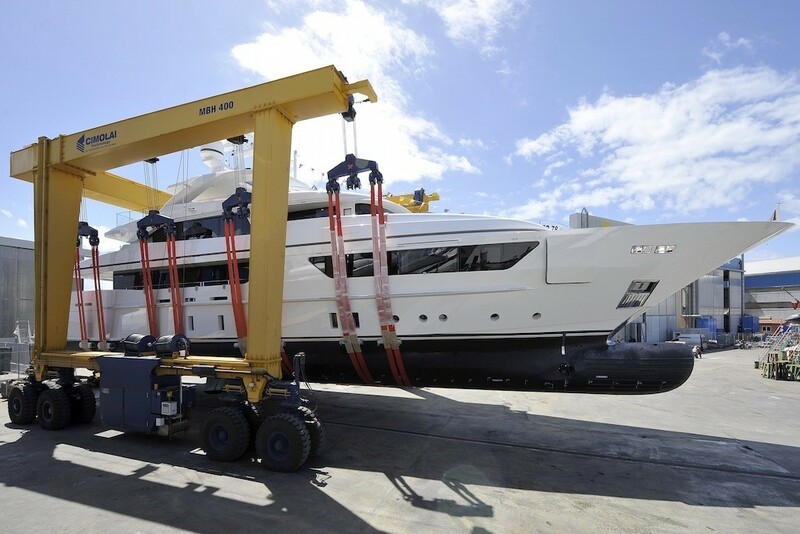 Behind, the tender garage has a starboard hatch for easy launch and retrieval. 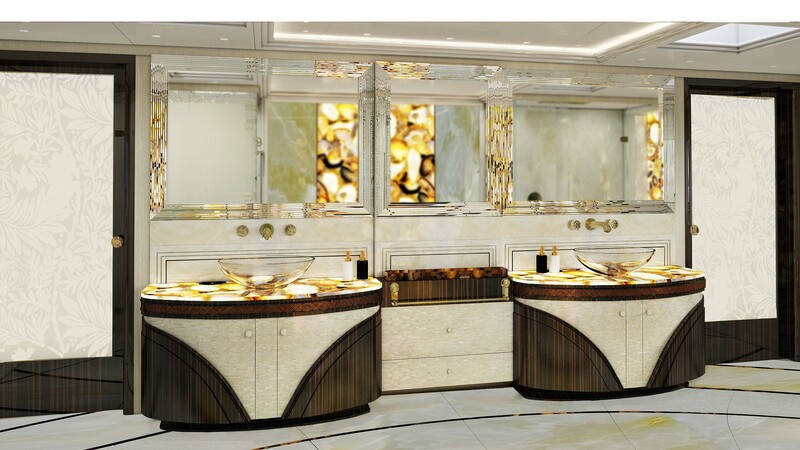 The engine room is aft of the amidships guest accommodation, where there are two double cabins and two twin cabins with stunning details where rare and semi-precious stones are black-lit to enhance the evening atmosphere. 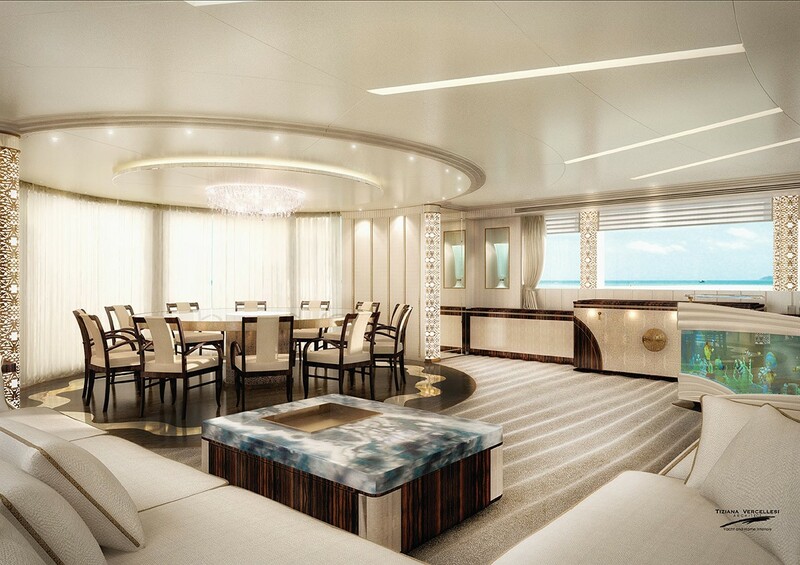 The lower deck forward is dedicated to crew accommodation and the galley. 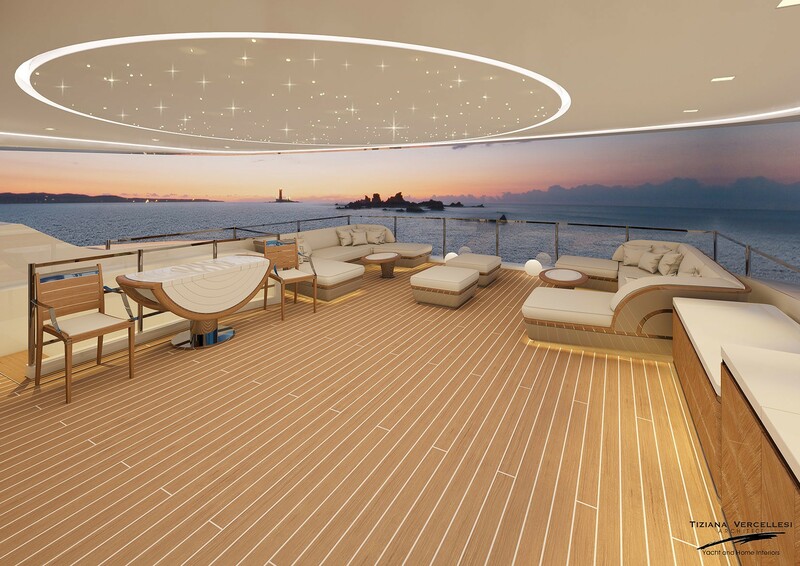 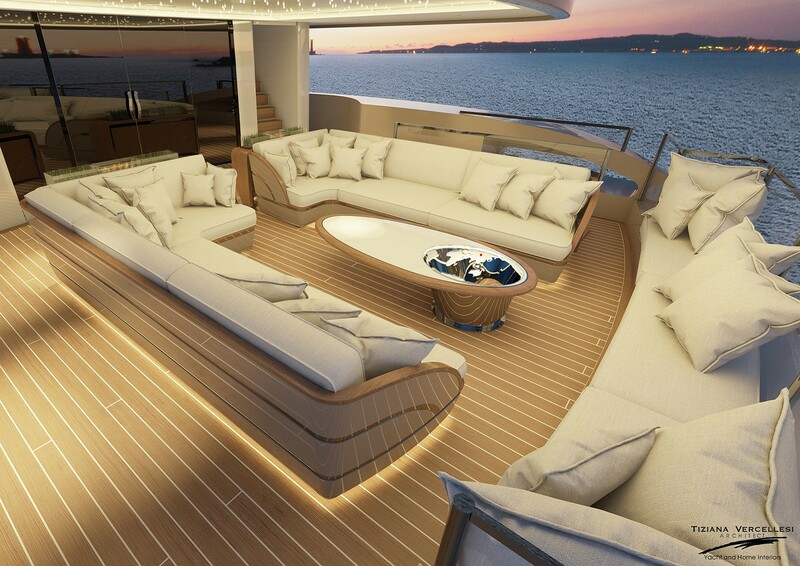 Guests occupying the main deck forward will appreciate the full-beam layout, which contains stunning monochrome features with a starry LED ceiling, a chaise-lounge and a vanity. 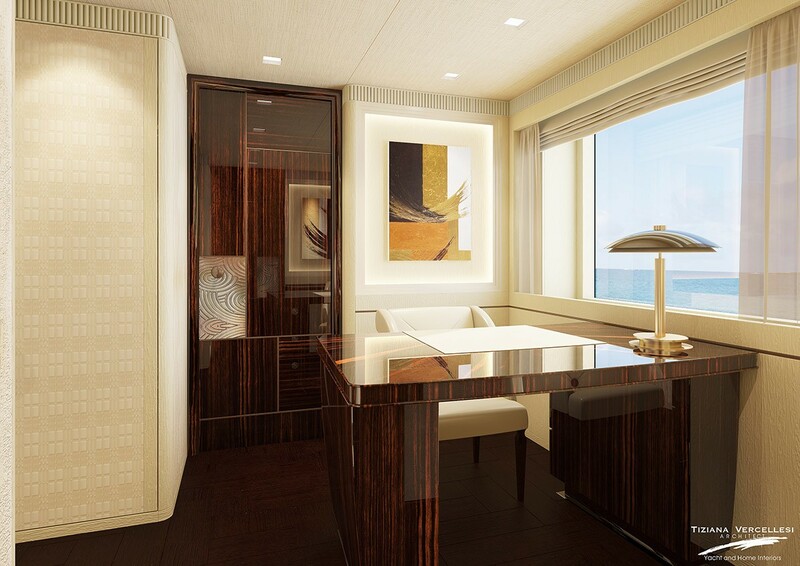 The Master office is located between the suite and the main foyer for greater privacy. 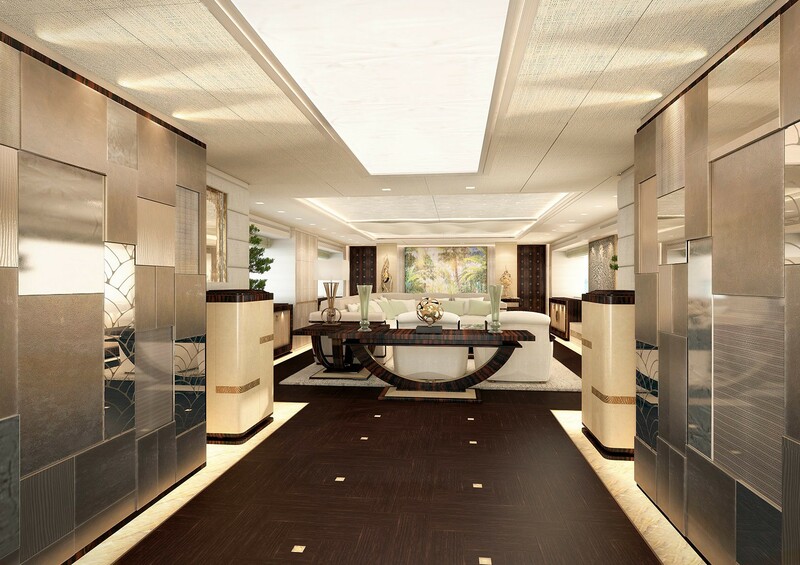 The main salon is a spacious and bright environment, where Makassar wood is used to contrast against the white walls and complement the modern and traditional Asian styling. 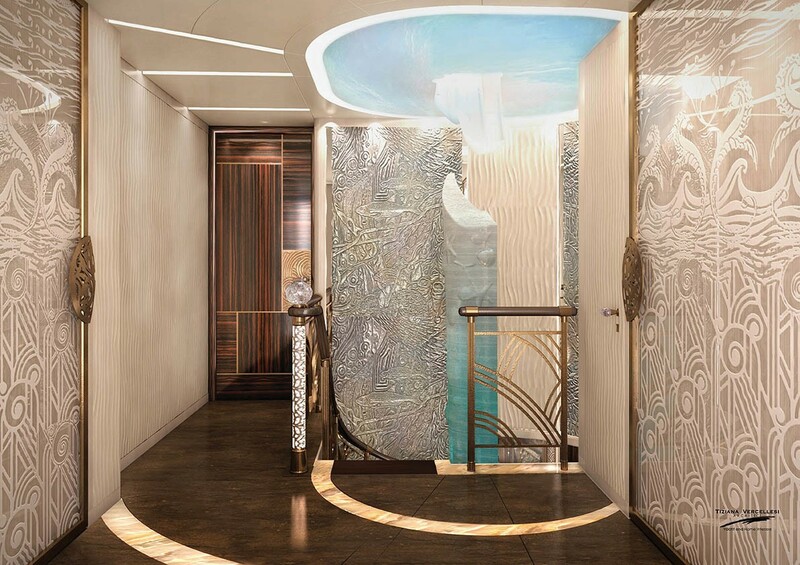 One notable feature is the lotus lights on the ceiling in the entryway, While above the C-shaped sofa arrangement the lights are placed in constellation-like formations for an enchanting evening atmosphere. 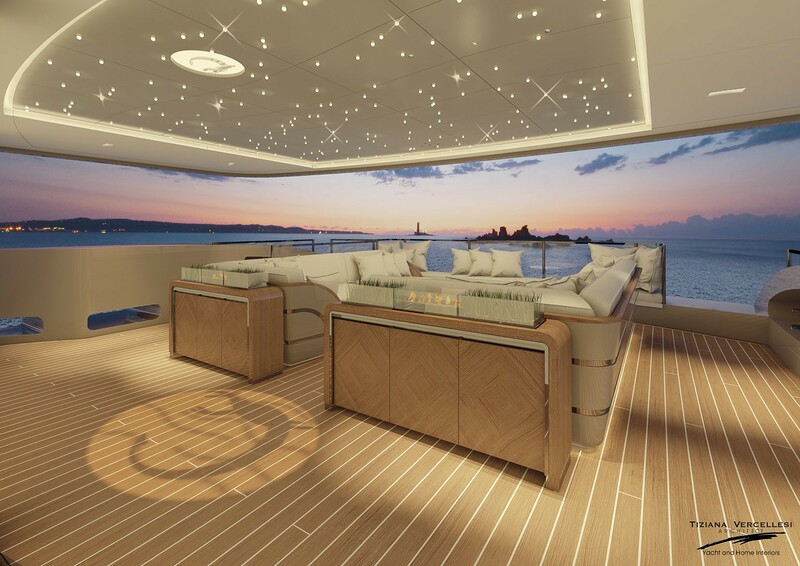 The upper deck hosts the helm station and the Captain's cabin, with the aft section dedicated to the sky lounge. 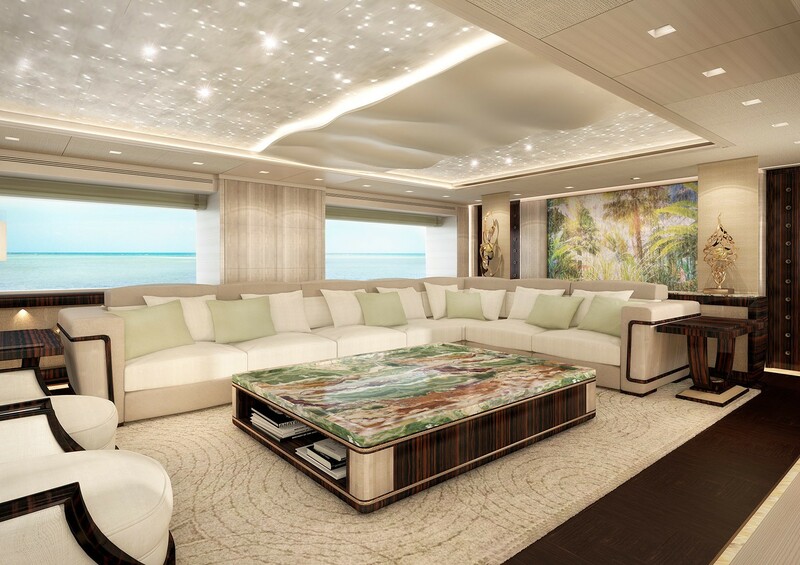 Guests will immediately notice the fish tank bar in the forward port corner and this calming feature can be enjoyed from the extensive seating on the opposite wall. 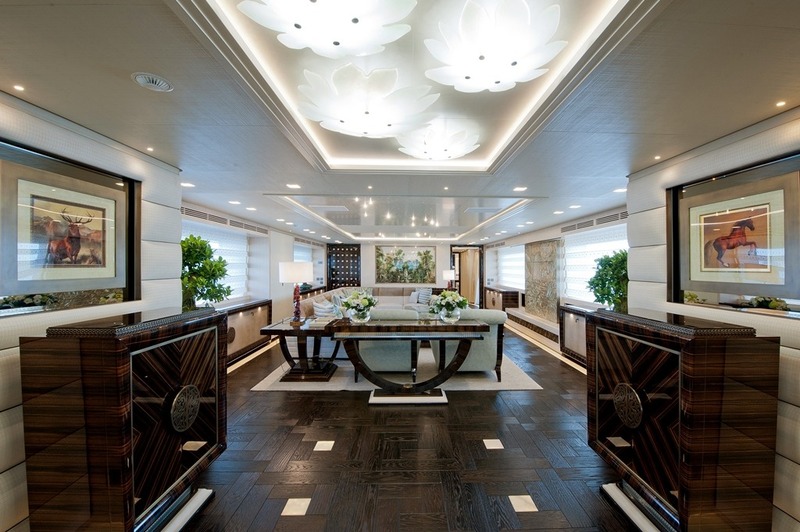 The stately dining area is placed close to the upper deck aft sliding doors for a greater connection to the environment while dining. 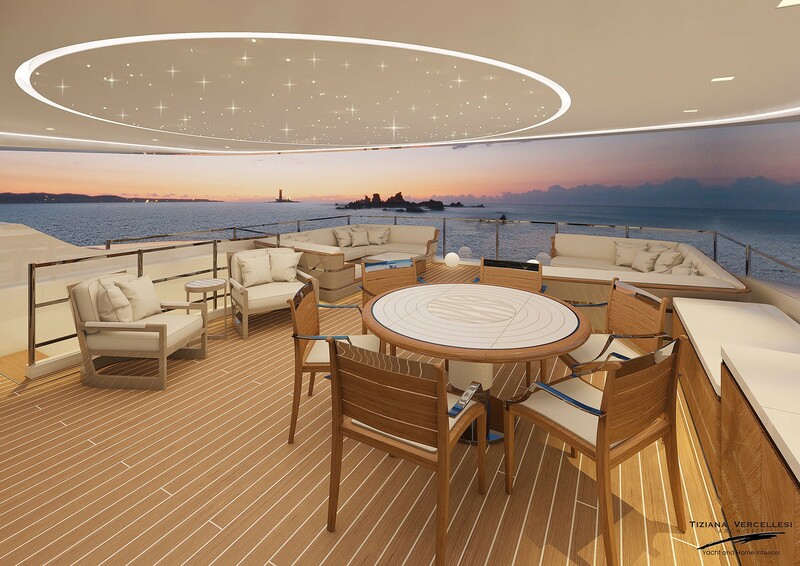 The area is comprised of 12 chairs around a circular table and the mirrored ceiling amplifies the illumination from the coral-like chandelier. 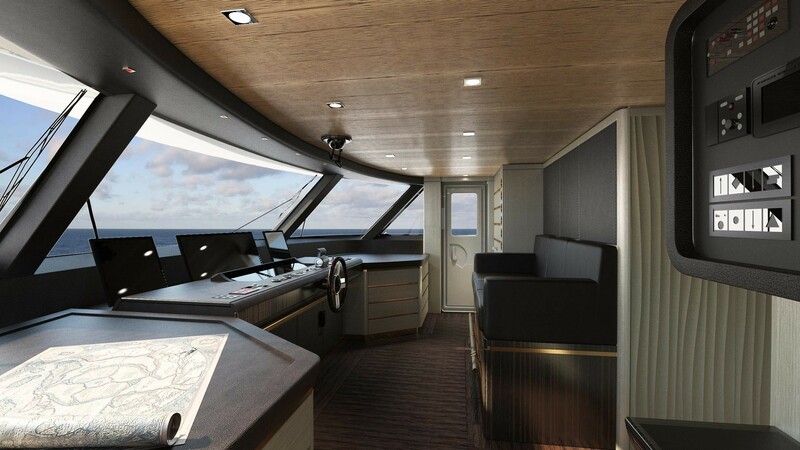 Twin CAT 3512B DITA-SCAC engines allow for a maximum speed of 17 knots, a cruising speed of 14 knots and a range of 2,250 nautical miles. 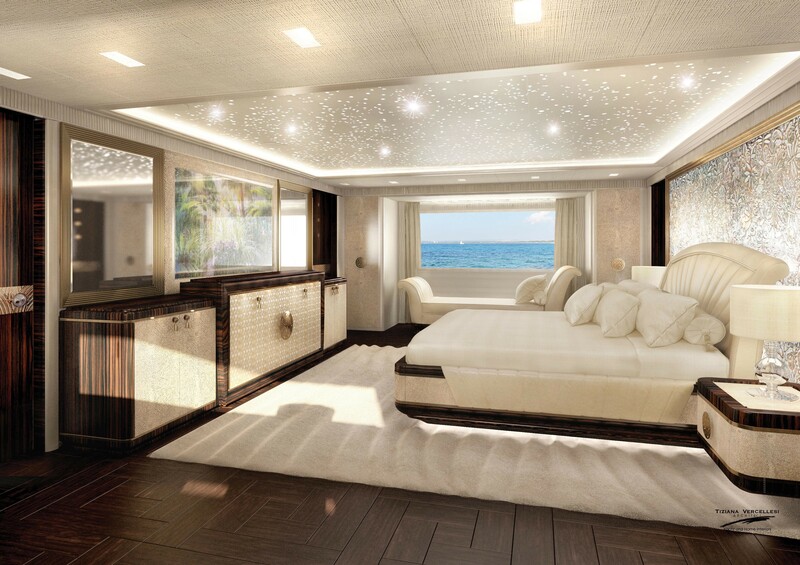 The accommodation sleeps up to 12 charter guests over 5 beautifully appointed en-suite cabins: 1 Master suite, two double cabins and two twin cabins. 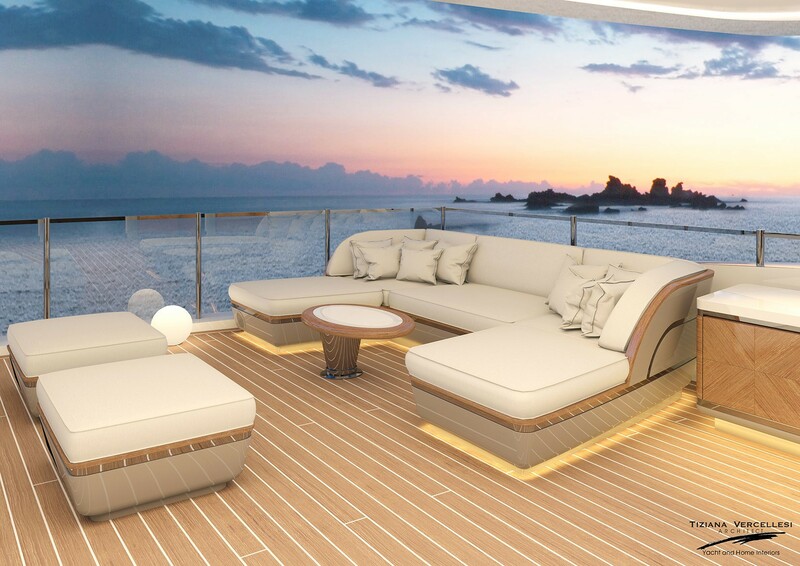 The crew of 10 will provide everything guests need for an incredible holiday in some of the world's most enchanting destinations. 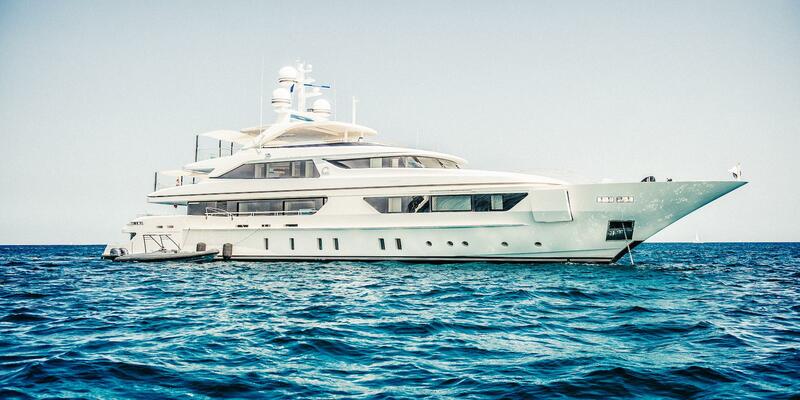 We do have available further amenity, owner and price information for the 46.00m (150' 11") yacht 46STEEL LUXURY SUPERYACHT, so please enquire for more information.